N O T E : Much of the information taken from Kent’s testimony completely contradicts Hollie’s experiences and even some of the details that were provided to Michelle by her adoptive father in 2017. We will be writing about these inconsistencies at a later date. CAMDEN – Edward Kent, a Willingboro attorney who specializes in divorce cases, was convicted yesterday of illegally acting as an intermediary in the adoption of three newborn children. Kent, 55, who lives in Edgewater Park, was acquitted of three accompanying charges of obstructing justice. The state, through Deputy Attorney General Nancy Singer, had charged him with encouraging the natural mothers to lie during interviews with state and county agencies about his involvement in the placements. The verdict was announced yesterday by Superior Court Judge Peter J. Coruzzi, who heard the case without a jury. Coruzzi will sentence Kent in about four weeks. The lawyer faces up to three years imprisonment and a $1,000 fine on each of the three counts. Defense attorney Carl D. Poplar of Haddonfield said he will appeal the conviction. Pre-trial motions and testimony lasted four weeks. Much of the pre-trial time was taken by listening to tape recordings of conversations between Kent and one of the natural mothers and preparing transcripts of those tapes for later admission into evidence. The adoptions took place between December 1976 and May 1977. In convicting Kent, Coruzzi said the statute covering placement of children is simple but specific. It forbids assistance by anyone other than the natural parents in placing a child in another home. “He orchestrated the whole thing,” the judge said. The three natural mothers who offered their children for adoption approached Kent, who then contacted families who were hoping to adopt a child. Kent passed on the name and phone number of the pregnant women, according to testimony. He repeatedly told the women and the adoptive parents that he could not arrange meetings between them. The adoptive parents paid the medical costs of the pregnancy and delivery and received the children as the mother left the hospital. 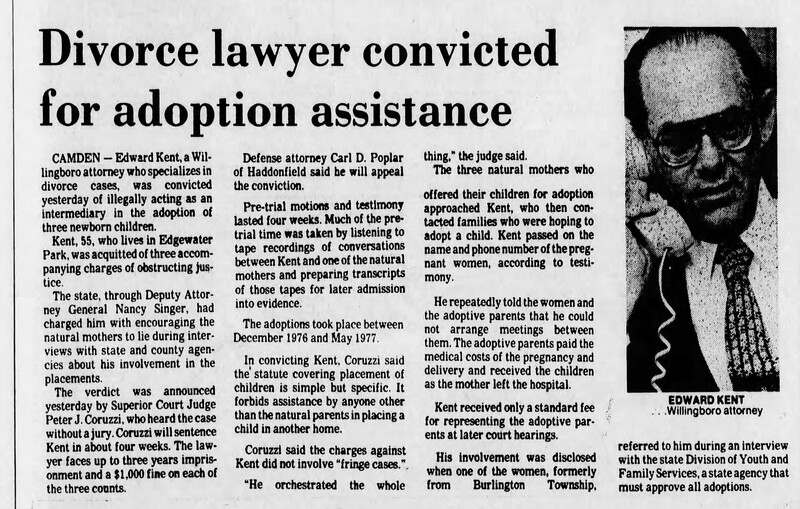 Kent received only a standard fee for representing the adoptive parents at later court hearings. His involvement was disclosed when one of the women, formerly from Burlington Township, referred to him during an interview with the state Division of Youth and Family Services, a state agency that must approve all adoptions.